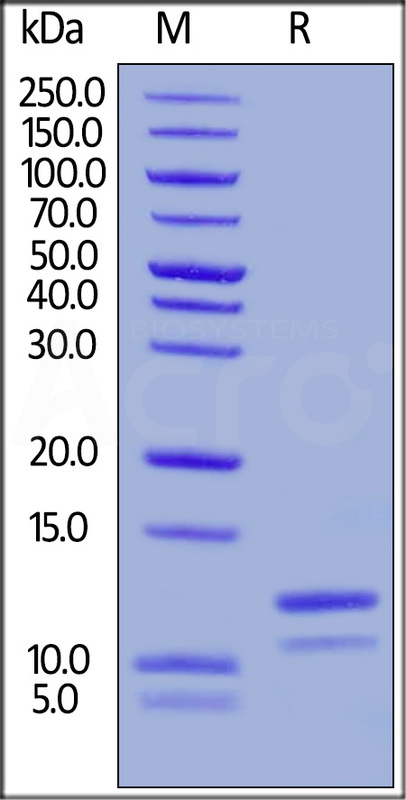 Human Apolipoprotein A-II, His Tag (APA-H51H6) is expressed from E.coli cells. It contains AA Ala 19 - Gln 100 (Accession # P02652-1). The protein has a calculated MW of 11.2 kDa. The protein migrates as 11 kDa and 13 kDa under reducing (R) condition (SDS-PAGE) due to glycosylation. Human Apolipoprotein A-II, His Tag on SDS-PAGE under reducing (R) condition. The gel was stained overnight with Coomassie Blue. The purity of the protein is greater than 90%. Apolipoprotein A-II(APO-A2) stabilize HDL (high density lipoprotein) structure by its association with lipids, and affect the HDL metabolism. It is produced by the liver and is involved in cholesteryl ester formation and cholesterol transport from tissues to the liver. Recent studies have established the interaction between APOA2 -256T>C polymorphism and dietary saturated fatty acids intake in relation to obesity on healthy individuals. Significant interaction between APOA2-saturated fatty acids intake and body mass index (BMI). The result of this study confirmed the interaction between APOA2 -256T>C polymorphism and SFAs intake with BMI in type 2 diabetic patients. (1) Kobayashi T, et al. 2018. Biochem Biophys Res Commun. 497(3):903-907. (2) Basiri MG, et al. 2015. Genes Nutr. 10(3):464. (3) Ma C, et al. 2015. Biomed Res Int. 2015:481621.